I was never out of questions to practice for IIBA Business Analysis Professional certification as there were enough to practice on processexam. I am in love with this site. 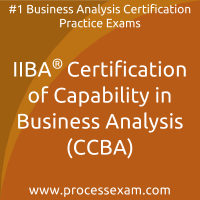 IIBA Business Analysis Capability (CCBA) certification exam was simplified after I did practice on IIBA CCBA mock tests. It helped increased my confidence and helped me strengthened my weak areas. It gave me personal attention while preparing for IIBA Certification of Capability in Business Analysis (IIBA CCBA) certification exam. The tailor-made approach worked best for me. I scored 81% in ​IIBA CCBA exam. Giving IIBA CBAP mock tests repeatedly on this site has helped me understand my strengths and weaknesses for the IIBA Business Analysis Professional certification exam. I scored 85% in actual!! What a site! 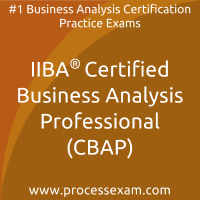 79% is my score in IIBA Certified Business Analysis Professional (CBAP) certification exam. Thank you, processexam paid CBAP mock tests!! !